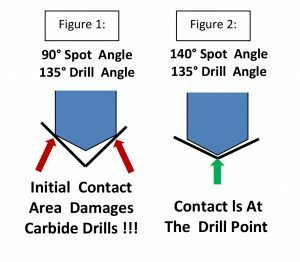 Some of the most frequent abuses to a carbide twist drill comes from using a spotting tool with too sharp of a point angle compared to the drill point angle. 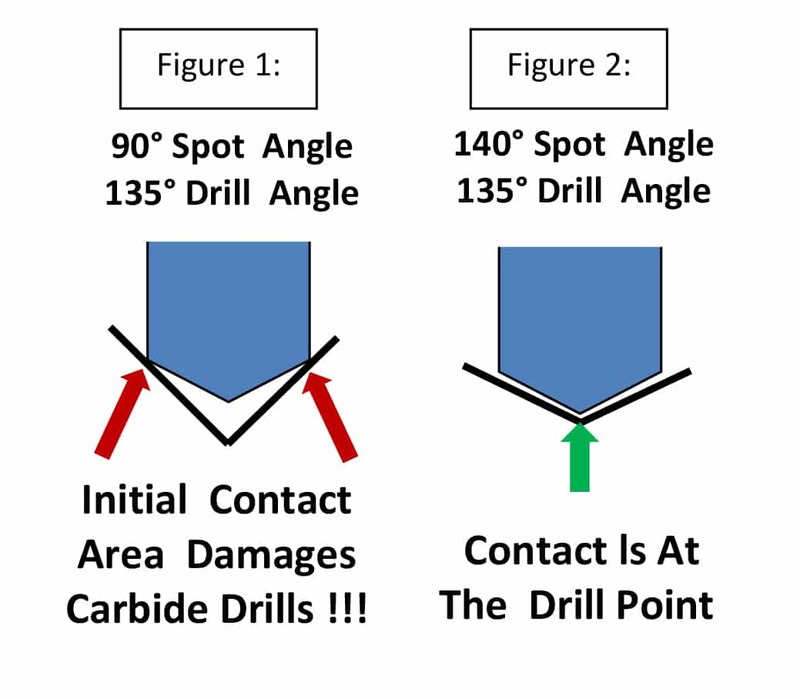 I’m going to discuss the 2 largest contributors to damaging a high-performance carbide drill – the centerdrill and the 90° spot drill. Let me get right to the point…the angle of the drill point that is. The concept of drilling holes has been around for a very long time. A twist drill is a very effective tool to produce a hole in a variety of materials. Besides the substrate of the drill (high-speed steel, carbide, carbide tipped), the design of the drill can and does change due to the material being drilled. Noticeable features such as the flutes may have different helix angles to remove chips more efficiently in certain materials. Another choice you need to make is the included angle on the point of the drill. The drill is designed to cut from the drill point outward along the angled “lips” of the drill until the eventual diameter is created then penetrate to the desired depth. As an industry standard, the 118° drill point was the point found on drills. As materials became more difficult to drill, cutting tool manufacturers began adjusting the drill point to angles such as 135° and 140°. The result was improved tool life. Solid carbide twist drills became more and more desirable due to the heat resistance carbide provides. But the problem with carbide compared to high-speed steel is the brittleness of the carbide. Although carbide can withstand heat better than HSS, carbide cannot handle any abuse or shock as it will chip, crack or break. HSS is tougher and can be abused a little more. For the sake of this explanation, I’m featuring a high-performance solid carbide drill that has a 135° drill point. The most obvious reason why someone would choose a 90° spot drill is for the resultant 45° chamfer it leaves after the drill is finished. Great idea for not having to deburr the hole later, but a very poor choice for the tool life of the drill and eventual accuracy of the hole itself. As shown in Figure 1, the 90° spot drill creates a steeper angle than the drill point. The initial contact the drill makes is with the very fragile corners, not the drill point as it is designed to cut with from the start. Figure 2 shows the correct spot drill angle with a 140° spot drill. Now you can see with a spot angle blunter than the drill point, the initial contact takes place at the point, which is how the drill is intended to cut. Now let’s talk about the topic of this article – centerdrills. Since we now know the damage produced by ONE incorrect angle, what happens when the drill makes contact with TWO incorrect angles? The centerdrill is designed to leave a feature in a part that makes a secure contact point with a live center, a dead center or some type of support apparatus. As seen in Figure 3, the pilot diameter “B” (which has a drill point of 118°) will simply leave clearance in the bottom of the feature so the point of the live center won’t bottom out. The depth of the pilot is designed based upon the angle of the countersink desired. 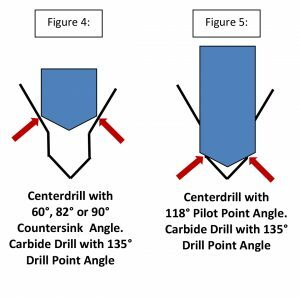 Centerdrill countersink angles basically come in 3 angles: 60°, 82° and 90° included angles. A common angle used in live centers is 60°. Flat head screws utilize an 82° design and once again the 90° leaves a chamfer afterwards. Those 3 factors would be the most obvious reasons why someone chooses those specific countersink angles on a centerdrill. Now let’s look at how the 2 angles on a centerdrill work against the drill point. 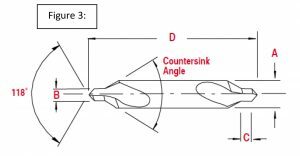 As seen in Figure 4, the high-performance carbide drill makes contact with the countersink angle first. This is the beginning of the damage to the drill exactly like the 90° spot drill damage. As the carbide drill continues to go deeper as Figure 5 shows, the drill then makes contact with the centerdrill’s pilot point angle. However, the area where the contact takes place is on the lips of the drill point creating “notches”. Once a notch is created the tool life immediately diminishes and the accuracy of the hole will not be what is expected of the drill. The drill begins to wander in whatever direction it feels like going. If you measure the hole with a solid object such as a gage pin, you will believe the drill is cutting undersize. What the drill is doing is cutting in a spiral which will not allow the correct size of gage pin to snake through the spiral. Subsequent tools such as reamers and taps won’t like this spiraled hole either (more to come on that topic).